Amazon review: At last, Miranda is the life of the party: all she had to do was die. Elevated and adopted by none other than the reigning King of the Mantle of Dracul, Miranda goes from high-school theater wannabe to glamorous royal fiend overnight. Meanwhile, her reckless and adoring guardian angel, Zachary, demoted to human guise as the princess’s personal assistant, has his work cut out for him trying to save his girl’s soul and plan the Master’s fast-approaching Death Day gala. In alternating points of view, Miranda and Zachary navigate a cut-throat eternal aristocracy as they play out a dangerous and darkly hilarious love story for the ages. I liked the plot of this book a lot and the story had so much potential. Unfortunatly I felt a lack of emoitions throughout reading it. I went through the book pretty fast, understanding the characters reasons and actions. Despite this there were only a few moments where I felt for Miranda - the new vampire princess and her guardian angel/fallen angel Zachary. I believe the end was very heartbreaking but again I barely felt sad and didn't get hooked. Joshua: That is not one of the cherubim! That is a fat, naked white baby with wings! How could you do that? Body. Temple. Didn't you read The Written? Make sure to check her blog, its amazing! The first book I've read by Elizabeth Scott was Bloom. I didn't post a review even though I really liked the book. I guess I'm just a lazy person sometimes. Perfect you was just as good as Bloom. You can't help but to like the main characters Kate, Will and Anna (and maybe Todd). The story is life-related, humorous (I just gotta think of all the fake smiles Kates Dad put on :D), sad, difficult, sweet, heartbreaking, wise. Kate goes through one of those times when you believe there isn't one thing in this world which is good in your life. Her Dad is embarassing, the family is running out of money, her brother is annoying as hell, her scary Grandma is coming for a visit, her best friend pretends not to know her anymore and the guy she likes seems only to use her. I believe most people would dislike Anna after this book but I think Anna has her own story and can't be judged over easily. I loved Wills character. He is just a guy with problems on his own like everybody else. Kate was afraid to believe he realy liked her but in the end she risked letting herself enjoy his company and was proven that she doesn't have to expect the worst. Looking forward to read more of Elizabeth Scott's books, she brings such a fresh spirit! Well it's Jace & Clary again. I'm waiting for my obsession to be over. Here they are and I'm exsited to start reading! Set in Talia, a parallel world very similar to 16th-century Italy, the narrative follows Lucien, who in our world is very ill. Given a marbled notebook to use as a diary, the notebook is the unexpected means that transports Lucien to this dangerous new world; a world that thrills to the delight of political intrigue and where a life can be snuffed out with a flash of a merlino blade. The city of Bellezza (Venice in our world) is astonishingly evoked, with a filmic eye to detail, from the sensuousness of silks and velvets, to the thrill and danger of assassination attempts both and foiled and successful. The world of Talia is unforgettably and convincingly real. Kate Brown's life has gone downhill fast. Her father has quit his job to sell vitamins at the mall, and Kate is forced to work with him. Her best friend has become popular, and now she acts like Kate's invisible. I wasn’t a big fan of the first book >A Great And Terrible Beauty< because I thought there was something missing. Maybe some depth, I don’t know exactly. I always could put it down and read it later. Despite all this, the story is well written and I also liked the plot. So I decided to give the second book a try. I personally liked >Rebel Angels< more than I liked >A Great And Terrible Beauty<. But still something was missing to make it really catchy for me. Another point is that I think the friendship between Gemma, Felicity, Ann and Pippa wasn’t their choice. I always felt they could turn against each other every moment and there is also jealousy because Gemma is the only one who can go and take others into the realms. Felicity and Ann are blinded by the magic, immature and that makes me always think they are about to do something stupid. It always kinda annoys me. I always thought Kartik is an interesting character but we didn’t get so see a lot of him. This was my most anticipated book 2009! I can’t tell enough how I freaked when I got it earlier than expected. I had to read it in one day, I knew exactly I couldn’t concentrate on work if I hadn’t finished it. Here was my mistake AGAIN: I read spoilers, I couldn’t wait to know two things and maybe that was because I give the book 4 Stars than 5. I thought the first half was good, not outstanding. For the first time I didn’t mind Simon at all, I kinda thought he was cool and his character very supportive. The same thing goes for Isabelle, I liked her better than before because in this book you see she cares so much for everyone she loves. And it’s sad Sebastian/Jonathan killed little Max, I felt for Isabelle, Alec and Jace. Alec and Magnus. I love love love those two BUT I felt like there wasn’t enough moments with them and it kinda always seemed like you experience their story from somebody telling you what’s going on between them but you’re not right there in this moment. Sebastian/Jonathan. I felt he was weird from the start and you get some hints that something is wrong with him. I never felt he was a threat for Clary/Jace relationship even though he kissed her. I’m glad she didn’t get fooled by him when he tried to take her with him and stayed with Jace instead. I can’t help it his character felt kinda wrong to me (he wasn’t like I imagined Jonathan would turn out to be and at the same time he was exactly how he supposed to turn out I guess. Evil.Unpatient.Cold.Charming.) The moment Hodge saw him and called him Jonathan you knew he didn’t mean Jace and that was when you knew the truth. Jocelyn. I knew Magnus would wake her up and I was waiting for the moment she would show up. We don’t get to know her character very well, she’s asleep almost the entire series. But I thought it was interesting to hear her side of the story even though there wasn’t a lot to add to what we already knew. What I didn’t like about her was that she never, never showed any concern for Jonathan. He was her child after all. Not even after his death she showed grief or anything (in City of Bones we learn how she kept a box with things that reminded her of him and I was kinda disappointed that in this book nothing of that happened, that she wasn’t even sorry for not seeing him alive for the last time) and that takes me to the final battle. I was so hoping for a Valentine/Jonathan/Jocelyn/Jace&Clary enterference but it never happened. I was curious to know what they would have said to each other for the last time. I mean everything was explained and there isn’t much for them left to say but still I would have loved to see how they’d reacted standing facing each other. 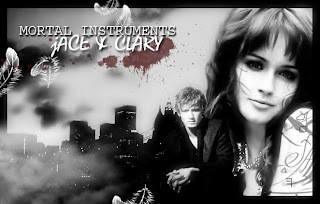 Jace & Clary. I loved them! They seemed to me more mature in this book because they stopped pretending and said how they felt about each other. As for the mature part…I LOVED how Jace freaked out when he saw Clary in Alicante :D and how he said he didn’t like Sebastian right in his face. The bonds between them were more tighter, you could always read it in their thoughts how they always put each other before everything else. Even when Jocelyn showed up and Clarys first accusation was why she never told her Clary had a brother. I’m glad Clary didn’t push Jace away the night before the battle, before he left. Even he was surprised she let him stay. And I knew when he died that she would ask the Angel for him. She could have wished for anything else in the world and she asked for his life. So everything turned out well. They are not brother and sister, Valentine and Jonathan are dead, Jocelyn is awake. THIS IS TORTURE. Im so fussy I have to wait for this book to come out. It makes me mad! This is one of my very favourite books and I'm suffering here. Big time! My second problem is: currently I don't live in the USA which means I won't get the book when it's out. I pray it doesen't take too long! The good thing is: I'll have some distraction in march cuz I'm going to Paris! So excited. I'll post some pictures when I get back...I'm trailing off! Anyway I couldn't resist to quote one of my favourite scenes from City of Ashes AND one of the best kisses written in a book. 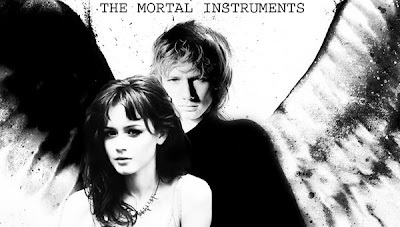 So if you haven't read the second book of the mortal instruments, you have been warned! Clary saw him, at the blurred edge of her vision, as he moved toward her and put a hand on her shoulder, turning her to face him. "It's just a kiss," he said, and though his tone was harsh, his hands were inexplicably gentle. She let him turn her, looked up at him. His eyes were very dark, perhaps because it was so dim down here in the Court, perhaps because of something else. She could see her reflection in each of his dilated pupils, a tiny image of herself inside his eyes. He said, "You can close your eyes and think of England, if you like." "I've never been to England," she said, but she shut her eyelids. She could feel the dank heaviness of her clothes, cold and itchy against her skin, and the cloying sweet air of the cave, colder yet, and the weight of Jace's hands on her shoulders, the only thing that were warm. And then he kissed her. She felt the brush of his lips, light at first, and her own opened automatically beneath the pressure. Almost against her will she felt herself go fluid and pilant, stretching upward to twine her arms around his neck the way that a sunflower twists toward light. His arms slid around her, his hands knotting in her hair, and the kiss stopped being gentle and became fierce, all in a single moment like tinder flaring into blaze. Clary heard a sound like a sigh rush through the Court, all around them, a wave of noise, but it meant nothing, was lost in the rush of her blood through her veins, the dizzying sense of weightlessness. Jace's hands moved from her hair, slid down her spine; she felt the hard press of his palms against her shoulder blades - and then he pulled away, gently disengaging himself, drawing her hands away from his neck and stepping back. For a moment Clary thought she might fall; she felt as if something essential had been torn away from her, an arm or a leg, and she stared at Jace in blank astonishment - what did he feel, did he feel nothing? She didn't think she could bear it if he felt nothing. He looked back at her, and when she saw the look on his face, she saw his eyes at Renwick's, when he had watched the Portal that seperated him from his home shatter into a thousand irretrievable pieces.